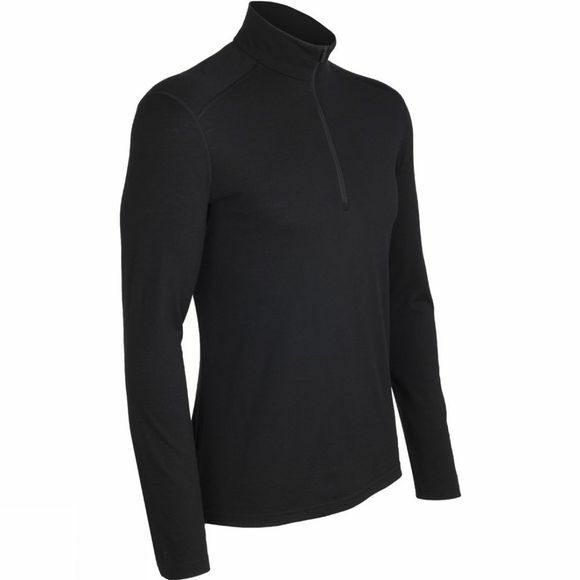 Designed to be worn on its own or as a base layer, the versatile Men's Oasis Long Sleeve Half Zip is made from lightweight Merino wool fabric to keep you highly insulated in cool conditions. It is ideal for hiking, climbing and snow sports. A high neckline with a zipped opening gives you fine control over your body temperature. Flatlock seams reduce bulk for easy layering and less chafing and offset shoulder seams prevent pack rub. A dropped rear hem provides extra back coverage. Icebreaker Merino wool fabrics are naturally lightweight, breathable and highly insulating, providing an extraordinarily effective means of regulating your body temperature. In cold conditions, the fibres trap millions of tiny pockets of air to insulate your body from the cold. In hot conditions the fibres transport sweat and water vapour away from your body to keep you cool. The fibres also naturally inhibit the growth of bacteria that cause odours so you can wear the garments for days without the need to wash them.